On the basis of its features as an objective personality test the risk choice behavior is considerably more tamper-resistant than a questionnaire test. Captures the general willingness to take risks. Main areas of application: traffic, occupational, and organizational psychology. Based on Atkinson's model of risk preference (1957) and psychological research on the subject of selection of aspiration level, the general willingness of a person to take risks is measured through achievement motivation. 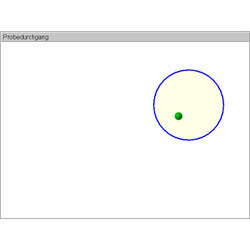 A green ball moves across the screen with an unpredictable change of direction. The subject shall steer a circle so that he / she captures the green ball and traps it inside the circle by means of the joystick of the subject panel. As long as the ball is within the circle, the subject obtains scores. The goal is to achieve a score as high as possible. The maximum score to be reached depends on the radius of the circle, which the subject can adjust before each stage. The test consists of altogether four test phases, and each of these consist of five runs. The administration phases differ with regard to the level of demand. The green point moves slowly during the first and fast during the second test phase. During the third phase the control of the circle is turned counter clockwise by 90 degrees and in the fourth phase the conditions of the first three phases recur apparently coincidental. In test the main variables willingness to take risks, overall scores, efficiency and standard deviation of the radius as well as the additional variables ideal radius, radius in test 4 and median points in test 4 are evaluated. In addition the auxiliary variable radius adjustment may be interpreted. Raw scores and percentile scores are given as test values. Due to the mode of calculation used the calculation of inner consistency is not meaningful. However, at present studies are under way to determine retest reliability and a long term stability. Initial statistical correlation analysis buck up the convergent and discriminant validity of the RISIKO test. The norm sample consists of N=451 individuals (219 men, 232 women; age range 16-91). The data were collected in 2004 in the research laboratory of the Schuhfried GmbH.